We raised an amazing £450 at the Sanctuary's Summer Satsang & Kirtan event on Saturday 18th June, which was added to Ruth Havenga's 'Three-Peak fund-raising challenge' for the 'Piam Brown' Unit at Southampton Children’s Hospital. Thank you to you all for your donations, you're an amazing group of people! To mark the anniversary of Swami Sri Yogeshwaranda's MahaSamadhi on 23rd April, donations of £335 were raised in support of Wessex Cancer Trust, which along with many additional online donations, went to support YS Teacher Trainee, Elliot Donnelly's fund-raising London Marathon Run in April 2016. In celebration of Shivratri 2016 donations of £215, plus on-line contributions, went towards the Nepalese charity 'All Hands Volunteers’, nominated charity of student Amie who flies out to do hands-on volunteering with the charity shortly! What a wonderful evening to close an amazing 2015 at the Yoga Sanctuary! 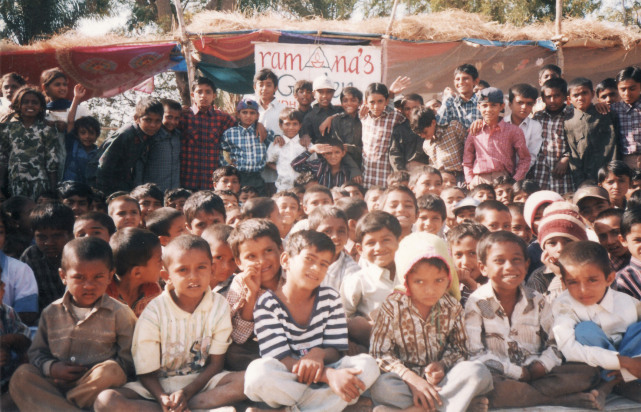 HUGE THANK YOU'S for your donations to our chosen charity of 'Ramana's Garden' in Rishikesh, India. Last night we collectively raised £1,185, and with the generous donation of the 'PearTree Develop Fund', this means the figure will be doubled to a staggering £2,370!!!! Your pockets are as deep as your Hearts are Big! ‘Ramana’s Garden’ in Rishikesh, India, is a wonderful children’s home and school set up to support abandoned, orphaned, destitute and abused children who are given food, shelter and education so they may thrive. The school is currently raising money to install solar power. WOW £820 raised by the Yoga Sanctuary Sangha from Divali celebrations, which means we can share the light in a tangible and practical way to help transform a school in rural India. Huge Thank You to all the Yogis who brought some light out of their pockets - monies raised will go with direct effect to the Shahdol Foundation in India, this together with the donations from Deva Deva Yoga School in Holland, means we can make a real difference to over 600 under-privileged children attending the Shahdol school in rural India. Donations from both Yoga Schools greatly exceeded the £1000 target required to create a new well for drinking water, and along with a couple of large individual donations from students of Deva Deva it means they also have enough left over to purchase a new tractor for their agricultural activities. Amazing, what a difference we can all make as a collective energy! "Dear beautiful people, we from Shahdol Foundation are very grateful for your donation to the children on our school in India. the waterwell we had made in 2000 has dried up, and with this money we are able to make a new one. all the children are using this well on the school. now we have 630 children who have free education and 35 boys are living in the hostel next to the school. with donations like this we are really able to give something back to the world. in our tradition we say, come to learn and go to serve. in name of the children thank you my dear brothers and sisters, Namaste." Donations from Kirtan Events in June and September 2015 were sent to the Greek Rescue Organisations, who are receiving an ever increasing number of refugees on their shores. The 'Hellenic Rescue Team' used donation of £550 in September to purchase supplies and distribute them to refugees stranded in FYROM. Donations in June of £650 was sent to Hellenic Red Cross and to Hellenic Rescue Team based on the island of Kos, who used the funds to purchase essential supplies such as water, food and blankets.